The MediaTek Helio X20, with its deca-core CPU and Mali-T880 MP4 GPU, recently was spotted powering up the HTC One A9 on GeekBench. Not surprisingly, the chipset scored very high. 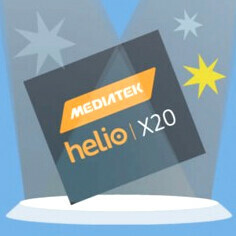 With that performance in mind, today we have a series of comparisons showing the MediaTek Helio X20 taking on the previous generation MediaTek SoC, the Helio X10. Also part of the testing is the powerful Samsung Exynos 7420. That is the SoC that drives the Samsung Galaxy S6 and Samsung Galaxy S6 edge. It also is expected to end up in one variant of the Meizu Pro 5 (with the other version containing the Helio X20 MT6797 from MediaTek). On AnTuTu, we can easily see how the Helio X20 outscored the Helio X10 by 40%. On GeekBench3, measuring the performance of each chip's CPU, the Helio X20 scored a single-core tally 70% above the Helio X10. For the multi-core score, the newer chip had a more reserved 15% improvement. Moving out of the MediaTek family, the Helio X20 trounced the Qualcomm Snapdragon 810 in both single and multi-core results. Compared to the Exynos 7420, the MediaTek chip out performed it as well. A new unannounced Exynos 8890 chip being tested by Samsung on the Lucky-LTE device (which could be the code name of the Samsung Galaxy S7) scored well below the Helio X20 with a single-core tally of 1336 and a multi-core score of 4824. Compare that to the 1835 and 5884 single and multi-core scores produced by the MT6797, the Helio X20 chip being tested with the HTC One A9. Recently, the Snapdragon 820 SoC was spotted on running on Lucky-LTE (Galaxy S7?). Allegedly an enhanced version of Qualcomm's next high-end chipset, the SoC produced an AnTuTu benchmark score of 72,355 to top the Helio X20's results for the same test. Regardless of how the new generation chips score on benchmark tests, it seems like we can all be assured of some zippy behavior on the new high-end handsets set to be released later this year and into 2016.
so whats the point of the geek bench? gimmick..
GPU is on Adreno 330 (from SD800, not 801) level. It Will Fall Behind Sd810 And E7420 In GPU Cause They're Using The Mail T880-MP4 Instead Of The MP6 Or 8 But it Should Fair Well Powering A 1080p Screen Tho. Nope it was the ultra saving mode if you go by the leaks of the benchmarks that came out about the m1 before this leak came out, they about the same score as the leak that had all 3 scores, normal mode, power saving mode and ultra saving mode. Geekbench shows the frequency of the slower cores. Cmonnnn HTC... Show us what you are capable of with a good cpu. I Want To Know How The New Apple A9 Performs Its Sure To Blow These Guys Away In Gpu And Single Core Performance. Looks like A9 might, but A72 cores might blow the A9 single core performance too. But X20 being on 28nm chip might just come close or at best match A9 for single core performance. For GPU, I guess A9 will perform better than all, hands down. Lets see, in coming future new SOCs will do pretty well with 14nm, A72 cores, T880 GPU. The Battle For Top Soc Has Only Just Begun. With intel planning to re join game with new player, core m in phones, it's going to be bloody. Is That's Suppose To Be A Joke? Cause Its Not Funny At All. The Company That Makes The PowerVR GPU Is Called, Imagination Technologies. No, I think they were actually called power VR imagination technologies back in the Dreamcast days. Too bad Sega had opposite of Apple mojo and forced them into mobile. It would have been interesting to see what they could have done with a Dreamcast 2 GPU. Still, that system was amazing. Underrated as hell and they pulled the plug on it way too soon. I don't think SD 810 was oven because it was manufactured on 20nm exynos 5433 with similar CPU cores was manufactured on 20nm process. It was one of the reason but not sole reason. Actually 28nm is a very mature node and provides the best bang for their buck that's why a lot of mediateks of the world use it. 20nm is a flop and it looks like so is foundry 14/16 nm. 810 was a bad design as it was implemented with too high a clock speed for heat dissipation for a planar process that dense. Apple was able to utilize both because they don't clock their CPU as high and their sustained performance doesn't need high clocks. I would imagine x20 will handle the heat fine on 28nm but at the expense of efficiency which is fine as long as HTC doesn't skimp on the battery. Think of it as over clocking a 3 generation old intel processor it can keep up with the newer generation but you are consuming more power and you need active heat sinks to handle the heat. Sd 810 wasn't clocked super high, it was a little high than at what 5433 was clocked. 5433 ran cool and even after throttling to low clock speed SD 810 over heated. It was design issue, not related to clock speed, I guess. Stock ARM Cores vs Custom cores. Haven't you silly Android kids learnt your lessons yet? I warned that 810 (8 cores) wouldn't even be an upgrade from 800/801/805 (4 cores). And it hasn't been. Custom Cores > Stock Cores. Apple has been full custom since Apple A6 "Swift" architecture in the iPhone 5, which absolutely smoked Krait (Snapdragon S4/600/800/801/805). And it was released shortly after Krait debuted. Lmao, its only Apple who uses single core, because its OS is still halfbaked and was made for dummies and kids computer. A dual-core processor has many advantages especially for those looking to boost their system's multitasking computing power. Dual-core processors provide two complete execution cores instead of one, each with an independent interface to the frontside bus. Since each core has its own cache, the operating system has sufficient resources to handle intensive tasks in parallel, which provides a noticeable improvement to multitasking. A lot of people ask if 1GHz dual core is same as 2GHz single core. Answer is no, as frequency is only part of the equation, no matter how fast a single core is, it can only do one thing at a time. Going to a lower clocked dual is much better than a very fast single core. plus new apps and games build around dual core will never run as smooth on a single core. On top of it it will take less energy to run a dual core than a double frequency single core. So between 1GHz dual core and 2GHz single core processor, dual core wins. So technically four cores after better than two but i don't think if the advantage exist with octa cores since all are big. Little architecture too.